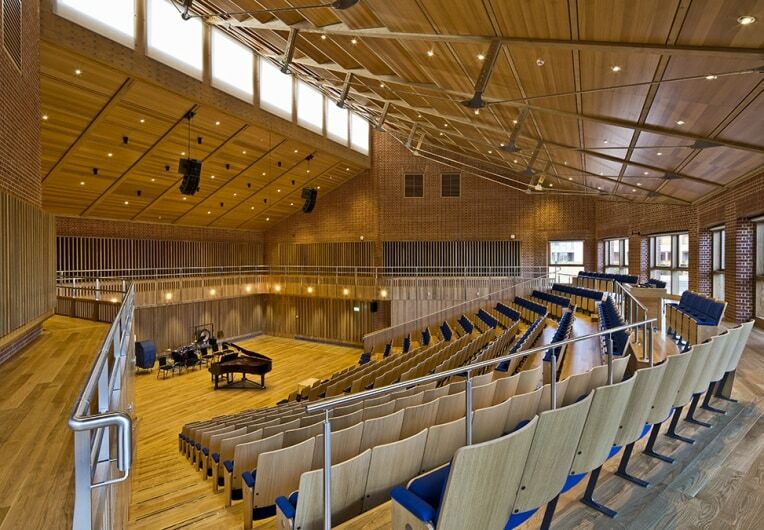 The Tom Wheare Music School at Bryanston School has been selected as the winner of the Interiors category at this year's Wood Awards ceremony. The new building faces a quadrangle and has been constructed of brick and wood to establish a visual dialogue with nearby buildings. The new building is located adjacent to the school’s historic Grade I-listed Main School Building and offers improved connections and visibility to the campus. The design responds to the richly varied context by arranging a series of intimate linked buildings with pitched roofs around an open central courtyard. Timber is a prominent feature in the 300-seat Auditorium where it is used on most exposed surfaces to create a warm, inviting and acoustically appropriate environment. Here, American white oak flooring, wall and ceiling panels join with specially designed oak acoustic panels (backed with sound-absorptive material) that can be individually adjusted to improve acoustic performance in the space. Spruce glulam timber beams support the roof. The fixed seating is timber backed.